Grasshoppers are insects of the order Orthoptera, which also includes crickets and katydids. There are many hundreds of known species of grasshoppers in more than 125 known genera. These incredibly abundant herbivores exist on every continent except Antarctica. "Grasshopper" refers to these insects in their typical physical and behavioral forms -- most species also have a high-density communal, swarming locust form that looks and behaves differently. Grasshoppers' palps are jointed external organs that form the outermost portion of the mouth. They have two sets. The maxillary palps are attached to the maxilla, or upper jaw. These palps have five segments each. The labial palps are attached to the labium, or lower lip. These palps each have three segments. Like the rest of the grasshopper's body, the palps are coated with chitin, a hard, rigid, waxy material that makes up the animal's exoskeleton. Palps have sensory hairs and chemoreceptors on their outer surfaces. 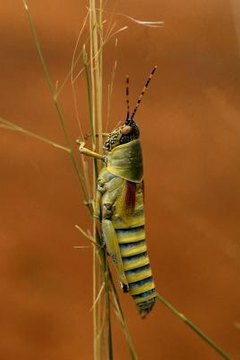 Their insides contain muscle and nerve fibers supplied with hemolymph -- insect blood -- by the grasshopper's circulatory system. Palps play a role similar to human lips and tongues. Their sensory hairs allow them to feel the texture of potential food items. Their chemoreceptors allow them to "taste" plants. This helps the grasshopper choose between plants that might by good to eat and ones that might be inedible or poisonous. Females also use chemoreception to decide where to lay their eggs, since they must choose areas with abundant sources of food for their hatchlings. Palps are also similar to human fingers. The grasshopper uses her palps to manipulate small pieces of food into her mouth and to hold them there while chewing. The palps also help hold larger pieces of food, such as a leaf, steady while the animal clings to it and bites bits off. Grasshoppers have hard, mostly external mouths that manipulate and crush food horizontally and vertically. Food passes through the tasting, manipulating palps first. Then it's chewed with up and down motions by the upper jaw, or maxilla, and lower jaw, or mandible. The labrum, or upper lip, and labium, or lower lip, hold and crush the food from side to side. The palps, labium and labrum keep the food inside the mouth while the animal chews it into small enough pieces to swallow.